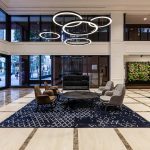 Investa Property Group engaged IA Design to design and document a new end of trip facility (EoT) at their 295 Queen Street, Brisbane asset. 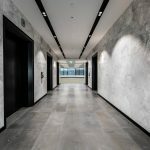 The building has recently undergone a significant refurbishment and the EoT was the last but arguably the most complicated piece of the jigsaw. The briefing and concept stage was unusual in that the facility was initially designed for a major incoming tenant with specific requirements and the location in the basement required negotiations between three ownership parties due to volumetric entitlements and car parking license arrangements. The usual challenges for services supply and waste and the fire exit requirements were also addressed. The design incorporated significant workplace safety input from multiple specialist risk and traffic consultants into our documentation to give a complete package to the builder. These challenges related to access and egress from the EoT space in a commercial building with a significant set of retail tenancies. The final design resolution provided a raised platform for the shower/change facility and high-quality finishes to match the base building approach.